AMID the ongoing debate about whether under-siege Carlton coach Mick Malthouse will see out the final year of his contract, tonight's 300-game milestone for dual Brownlow medallist Chris Judd has almost been overlooked. Even the 31-year-old, taken by the West Coast Eagles as a priority pick in the 2001 national draft, admitted the achievement had snuck up on him and it probably wouldn't sink in until he stopped playing. "I think you work out what these things mean to you when your career is over and you can look back and reflect," Judd said. "In the game, you're focusing on what's right in front of your nose, but I suspect it will mean a great deal and it will mean some personal recognition for how much work you put in playing footy." The former Blues captain played 134 games for West Coast, including the 2006 premiership, before being traded to Carlton in 2007. All up he has played 277 AFL games, 19 pre-season games, one State of Origin match and two International Rules games. 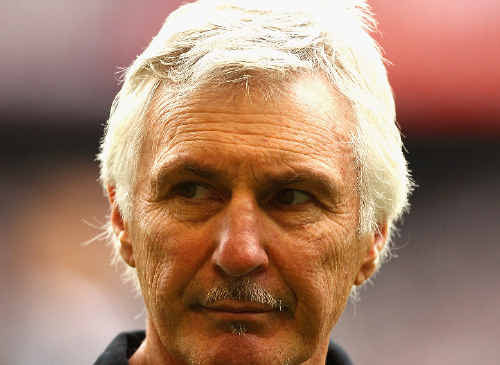 Meanwhile, Malthouse (pictured) said his main task ahead of the match against Geelong was to instil some confidence in his players. "You've got to restore confidence and the only way to restore confidence is a good victory," he said. "It's not as if we're sitting here not wanting a good victory, we want a good victory. If we do that (win) it clears up a lot of the uncertainties." Carlton has regained Kade Simpson and Patrick Cripps from injury and recalled Liam Jones and Dylan Buckley. James Kelly, Andrew Mackie and Tom Hawkins all return from injury for Geelong.